As we read God’s Word, we are reminded again and again that we are to pursue God with all our heart. Yet, in this fast-paced, over-scheduled world we live in, we often feel that is impossible. 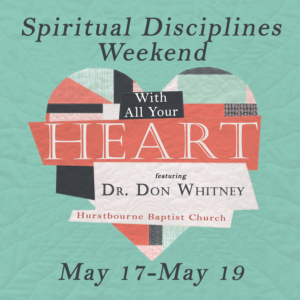 Join us as Dr. Donald Whitney helps us understand how we can pursue God in our homes as we love and lead our family. No matter what stage we are at in our life, it takes intentional effort to pursue God with all our heart. Dr. Whitney has written numerous books, including Spiritual Disciplines for the Christian Life, Family Worship, and Praying the Bible. See more info and register on our registration page.